The use of drones has become one of the latest hot topics within the media, with reports covering everything from their sometimes controversial military applications, to their position at the forefront of the latest Christmas toy craze. Perhaps less frequently publicised is the potential of these small flying platforms for environmental applications. However, within both academic and commercial arenas things are evolving rapidly. A buzz of excitement surrounds this technology and its potential as a new method for collecting highly detailed imagery and other environmental data. Within the civilian research sector there has been a move away from the term ‘drone’ to avoid the association with military use, and an uptake of the phrase ‘unmanned aerial systems’ (UAS) or ‘remotely piloted aircraft’ (RPA). Civilian Aviation Authority guidance has also been modified to account for the classification and regulation of such systems and their use. Within industry, the race is currently on to develop increasingly more powerful systems capable of flying for longer, with more autonomous control, and of carrying more advanced cameras and other sensors. Academic institutions up and down the country are endeavouring to acquire their own UAS and explore this new method of data collection. But despite this flurry of interest, much work remains to be done before UAS can become valuable and practical tools for real-world environmental applications. 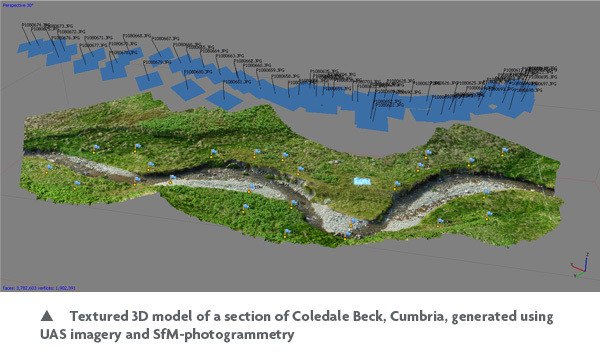 Over the last few years, my PhD research at the University of Worcester has aimed to make some progress in this area, by exploring how UAS might be used in conjunction with novel developments in image processing techniques, for mapping the physical conditions within rivers. These physical conditions include the channel topography and water depth, the size of the material on the channel bed and the distribution of patterns of flow on the water surface, as indicators of local hydraulic conditions within the river. These physical parameters are of critical importance for biota living within the river. Therefore mapping these attributes allows us to understand the quality and availability of river habitats and permits an assessment of river health, which is important for meeting European habitat standards required by the EU’s Water Framework Directive. If a UAS-based approach can be shown to provide accurate data and/or significant time or cost savings over existing river habitat survey methods, it may have potential as a tool within river science and management. My work involves the use of a small, rotary-winged UAS (the Draganflyer X6) to collect very high resolution imagery of river channels, using a standard consumer-grade digital camera. This platform is powered using electric Lithium-polymer batteries, each of which provides 5-10 minutes worth of flying time. The images collected from the Draganflyer X6 are then processed with powerful, specialist processing software which effectively stitches them together to create a single, continuous image. This software uses a novel approach called Structure-from-Motion (SfM), which is based in traditional photogrammetry. This method allows the production of a digital elevation model and a 3D dataset known as a point cloud. These are valuable outputs which can be used to create a detailed 3D model of the topography of the river system, to map variations in substrate size on exposed gravel bars, and identify differences in patterns of surface flow. The results obtained using this approach are presented in Woodget et al., (2015) and provide unprecedented levels of detail concerning these physical river habitat parameters, with high levels of accuracy and precision. 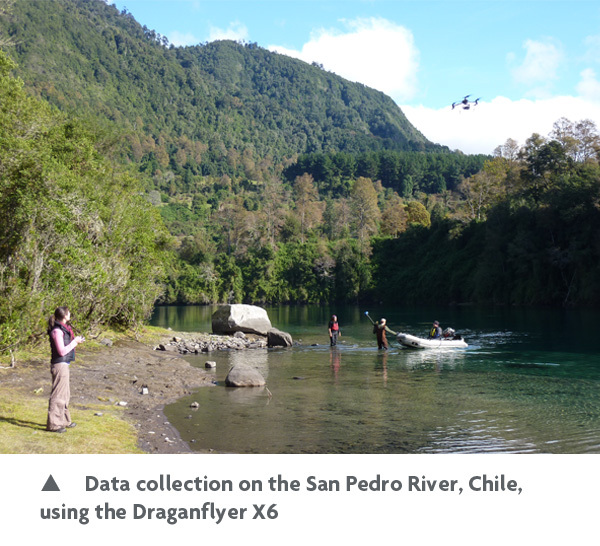 Compared to traditional field survey methods, the UAS data collection is much faster and less laborious, and provides a permanent record of conditions within the river which can be revisited later, or used to quantify change over time. Following the initial outlay for purchasing a UAS (around £10,000 for a system equivalent to one used here), the per-flight costs for operating a UAS such as this are very low and the image processing workflow is user-friendly, with little specialist training required. 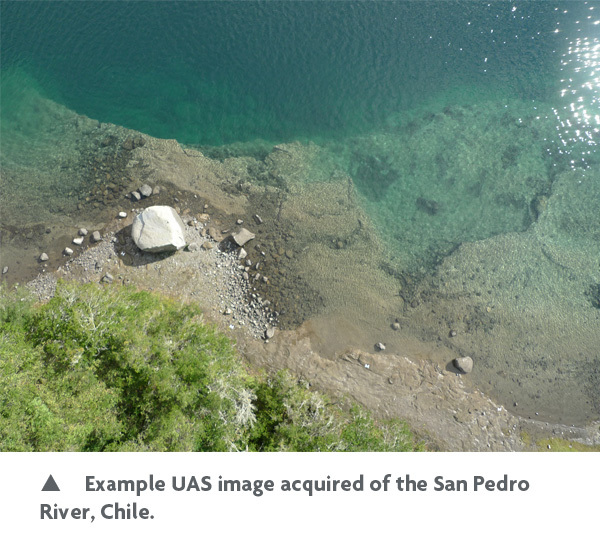 The UAS approach to assessing river systems is not without limitations however. The acquisition of good quality, blur-free imagery typically requires bright, sunny conditions, low wind speeds (ideally 0-5mph) and a confident, skilled UAS pilot. The imagery must feature sufficient texture (i.e. not great expanses of smooth or reflective surfaces) and clear water within the river in order for the SfM process to perform well. Careful placement of ground control targets within the area of interest is necessary for adequate spatial positioning of the output data and reducing the potential for systematic errors arising within the digital elevation models. The image coverage possible using this system is also currently restricted by the limited life of batteries on board the UAS, although newer systems are reportedly capable of longer flight durations. Despite these constraints, this research has demonstrated the proof of concept of this UAS-based approach for mapping a variety of physical river habitat parameters. 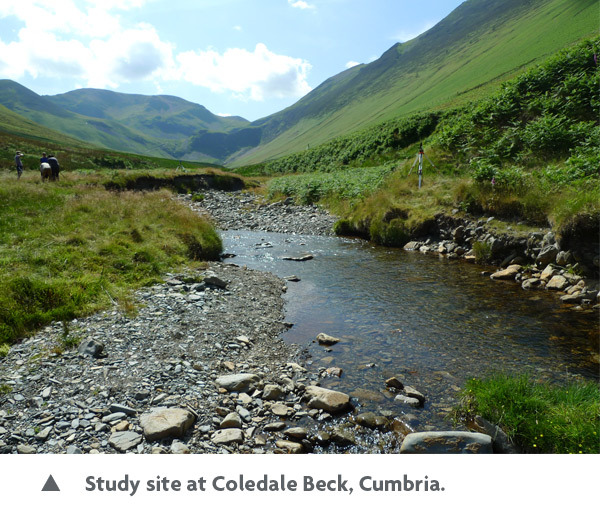 The nature of surveying in this way opens up new possibilities for quantitative, high resolution and high frequency monitoring of environmental change within rivers. This has the potential to result in new insights into the conditions and dynamics of fluvial habitats, and suggests that this technology could also be used for a wide range of other environmental applications. For this potential to be realised however, continued research is necessary. My post-doctoral research at the University of Worcester will be focussed on overcoming the current limitations of this approach and testing it within different river settings. Dr Amy Woodget is a post-doctoral researcher at the University of Worcester, having completed her PhD last year. Amy's research was highly commended by the judging panel of the IES John Rose Award for science communication. Amy will be speaking about her research at an IES North West regional group meeting at Manchester Metropolitan University on the 22nd June at 16.15, which will include a video demonstration of the Dragonflyer X6 in operation.